Offering you a complete choice of products which include moulded timing belts, coated or moulded timing belts, coated or moulded with punched belts, coated or moulded with special profile belts and feeder / moulded flat belt. We Sri Dharshini Enterprise market and sell the best in quality coated timing belts, we have ready stock of most industrial standard coated timing belt. We are the topmost organization in this domain, engaged in offering a premium quality range of Coated or Molded Timing Belts. Widely use in industrial synchronous transmission purpose, we check our timing belts on various quality parameters to deliver a flawless range at our end. We manufactured these timing belts from high grade material in our high-tech manufacturing unit in accordance with quality standards. 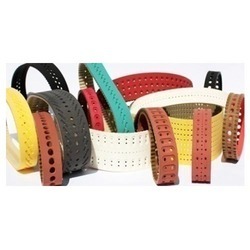 We are the reckoned manufacturer, distributor, trader and supplier of an exclusive array of Coated or molded with Punched Belts. These punched belts are extensively valued for its sturdiness, and durability. 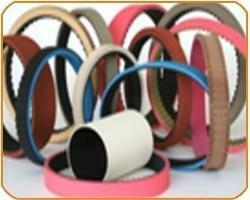 Our punched belts are provided in several specifications as per the needs of clients. We also examine our punched belts on number of quality parameters to deliver a flawless range from our end. Backed by the rich industry experience and knowledge, we are offering a commendable range of Coated or Molded with Special Profile Belts. Widely use for conveying applications, the offered profile belts are designed by inculcating advanced technology and using top quality basic material keeping in mind the quality norms. 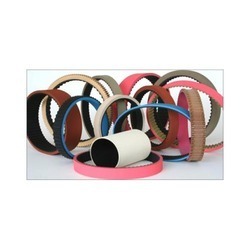 These profile belts are provided in various specifications to choose from. We have emerged as the topmost organization, engaged in offering a premium quality range of Feeder / Moulded Flat Belt. Best for use as back side idlers on V-belts, the offered flat belts are precisely manufactured by our highly skilled professionals by utilizing finest grade material and advance technology. 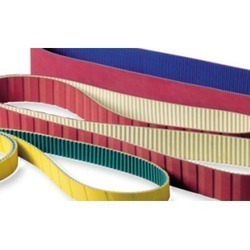 Our flat belts are provided in several specifications according to the needs of customers.